An institute and a University are learning institutions that are specialized to offer skills and knowledge to the students so that they can be productive members of the society. The term university is used to refer to a large learning center that offers tertiary education to students who want to specialize in specific disciplines which range from nursing, engineering, and business among others. Universities offer both undergraduate and postgraduate courses. This is the highest learning institution in the countries around the world due to the facilities and the courses offered. An example of a university would be the University of California in the United States and the University of Oxford in the United Kingdom. An institute is a learning center that is created by the government or members of the community to pass a specific skill or trade to the learners so that they can help in handling some of the challenges facing the society. An institute is specialized such that it concentrates on a specific area of study which can either be fashion, agriculture, arts, and technology among others. An example of a renowned institute is the Massachusetts Institute of Technology (MIT). One of the primary difference between a university and an institute is the courses offered. A University offers undergraduate and graduate courses. The university specializes in providing the highest level of education which makes it specialize in offering high ranking courses in tertiary education. An institute focuses on providing learners with a specific skill or trade that will help learners to execute a specific task. The courses offered at an institute level can be either certification or diploma courses at the highest level. Differentiation and specialization at an institute level are very high where an institute will offer training and development in a specific area of study. Technology related institutes will only provide training in technology related fields. This explains why the majority of institutes have their names ending with the area of specialization. For example, an institute will either specialize in arts, science, agriculture, fashion, or technology among other fields. Universities rarely specialize and are known to offer a large number of courses which cuts across all fields in the industry. A university will have campuses or departments specialized in offering specific courses. For example, Harvard Business School and Harvard Law School all under the management of the University of Harvard. Universities are large learning institutions that are categorized under government parastatals, which means that they enjoy the independence of management and decision making. They are self-governed through a legally constituted university council. On the other hand, institutes do not have autonomy of management and decision making. The government, through the ministry of education, indirectly controls the activities of the institutes through the board of directors. However, it is material to highlight that some vocational training institutes exercise a significant level of autonomy, especially the big institutions. Although both learning centers get funding from the government, universities receive large amounts of money due to the nature of the activities they handle. Moreover, a university is required to source funds from the students who pay for tuition fees and other charges that help in running the organization. Institutes do not receive large amounts of funds from the government because they handle simplified tasks and they do not require large machines and equipment. However, institutes are also required to charge tuition fees from the students to cater for administrative costs of the school. 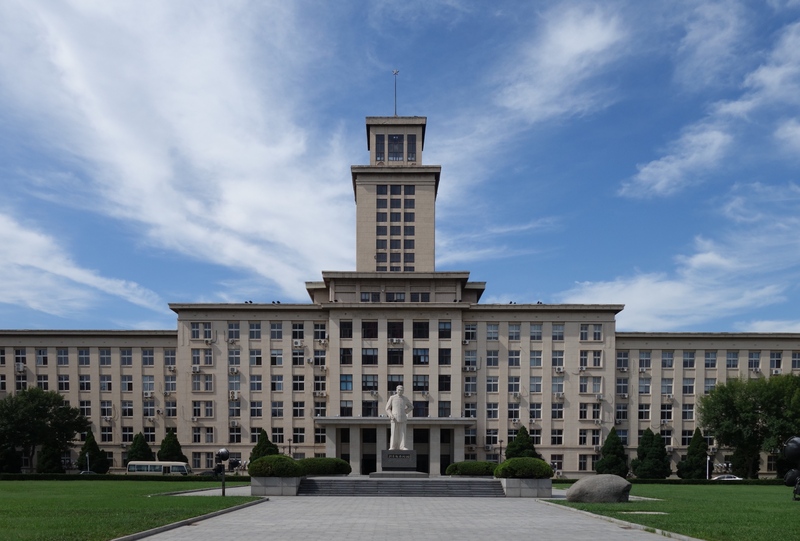 A university has large buildings that are used to house administration and the management of the organization, lecture rooms, student hostels, recreational facilities, libraries, laboratories, and auditoriums among others. The number of the students, lecturers, and non-teaching staff is very large which explains the need for the large structures and facilities. Some of the universities have more than thirty thousand students at any given time. 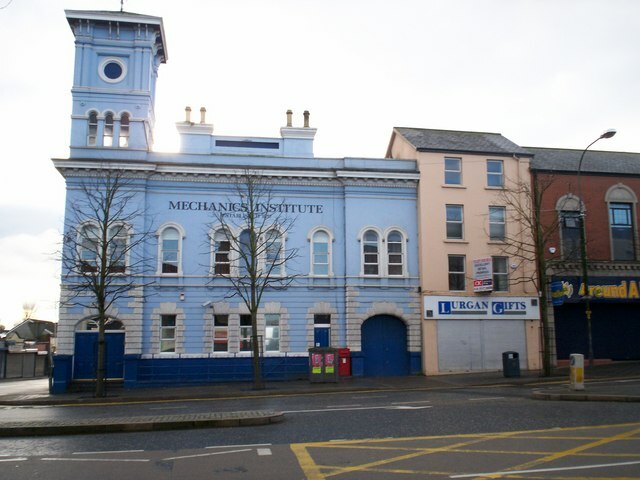 Institutes have relatively large buildings which are not many. This is because they do not have a large number of students and they do not need some of the facilities needed in a university. Institutes build rooms where students conduct practical activities rather than lecture halls. Lecturers and supervisors instructing at university levels are required to have attained professional qualifications in the area they are lecturing. This explains the reason why most of the instructors at the university level are professors and doctors. Although qualification is a fundamental requirement for any person applying to be an instructor at an institution, the level of qualification required is not very high as people with masters training can supervise learners at this level. A university is the highest ranking learning institution at a tertiary level which offers further studies in a specific area of specialization to students while an institute is a middle-level learning center that focuses on providing training in a particular trade. Universities have self-governing bodies which means that they have autonomy of management and decision making while institutes are indirectly managed by the ministry of education through the board of directors. Universities offer a wide variety of courses ranging from nursing, engineering, and law all in undergraduate and graduate levels while institutes provide certification and diplomas in a specific field which can either be fashion or arts among others. Other differences between universities and institutes include size, population, funding, and qualification of instructors among others. Jecinta Morgan. 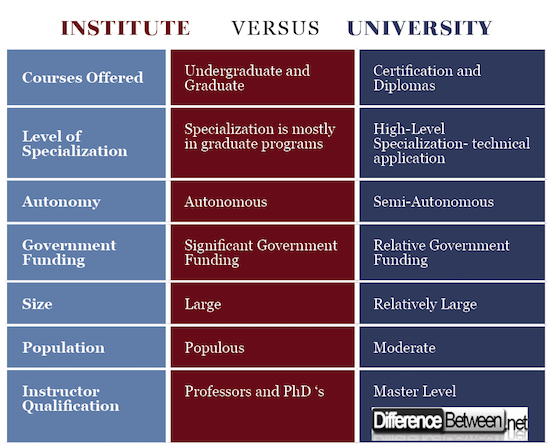 "Difference Between Institute and University." DifferenceBetween.net. March 26, 2018 < http://www.differencebetween.net/miscellaneous/difference-between-institute-and-university/ >. Clark, Burton R. Creating entrepreneurial universities: organizational pathways of transformation. Issues in Higher Education. Elsevier Science Regional Sales, 665 Avenue of the Americas, New York, NY 10010 (paperback: ISBN-0-08-0433545; hardcover: ISBN-0-08-0433421, $27). 1998. Kuo, Yen-Ku, and Kung-Don Ye. "The causal relationship between service quality, corporate image and adults' learning satisfaction and loyalty: A study of professional training programmes in a Taiwanese vocational institute." Total Quality Management 20.7 (2009): 749-762. Rowley, Daniel James. Strategic Change in Colleges and Universities: Planning to Survive and Prosper. Jossey-Bass Higher and Adult Education Series. Jossey-Bass Inc., 350 Sansome St., San Francisco, CA 94104, 1997.